Groundwater contaminations with chlorinated aliphatic hydrocarbons are (because of their characteristics) very difficult and expensive to remediate with traditional remediation technologies. The Punch Metals site is characterized by a very large CAH groundwater contamination that has migrated about 1km off-site, underneath a forest and has reached a depth of 50m. Punch Metals wants to remediate the off-site groundwater contamination in a cost efficient and environmentally sound way keeping the impact on the ecosystem as low as possible. Feasibility tests on lab-scale have indicated that the conditions for engineered bioremediation (ENA) are not optimal: injection of an organic substrate induces only partial dechlorination. By introducing suitable bacteria as well, full dechlorination may be induced as has already been demonstrated in the lab tests. 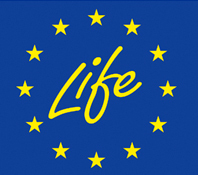 The main objective of the LIFE project is to demonstrate that such bioaugmentation (BA) can be achieved on full-scale in a cost efficient way. This will be done by adding microbial cultures, pre-grown in laboratory bioreactors, to enhance microbial populations in the contaminated groundwater zone to improve contaminant clean-up and reduce remediation time and costs. BA has not yet been used in Europe as a remediation technique on this scale. BA is taking remediation one step further than enhanced natural attenuation (ENA). Remediation results show that in about 50% of cases, ENA does not suffice because the right type of bacteria are absent to complete the biodegradation of the contamination. However, for large contaminations, ENA is the only economical and environmentally feasible remediation option (traditional remediation methods are very energy-consuming, produce secondary emissions and may damage ecosystems, e.g. by decreasing groundwater levels that may damage trees). Actions and means involved: The project will be carried out in different phases. In a first phase, potential useful microbial consortia will be screened in order to select a population that is supplementary to the existing on-site population. In a second phase, substrate and the selected microbial culture will be injected into a limited number of injection wells. Afterwards, the remediation will be up-scaled to cover the entire contaminated off-site area. During the small-scale start, a methodology will also be developed for the transfer of the microbial population from the remediation area to contaminated zones. By doing this, the costs for the laboratory production of the microbial culture can be decreased, improving remediation technology efficiency. After up-scaling, the developed methodology will be adjusted (if necessary) and evaluated. Dissemination of knowledge will take place throughout the project, but will be most important after the up-scaling of the technique.